Current mood: super, super excited! In just a little less than two weeks, Brons and I go back to Japan. I can’t believe it’s been almost a year since we were there. It was such an amazing experience that we decided to go back again. BACKPACK – better than a handbag or shoulder bag as it fits more items and doesn’t cramp one side of your shoulder. The more compartments, the better. Find a lightweight, versatile and classic style that will match any outfit, such as the Calais backpack from TUMI’s Voyageur Carson collection. TRAVEL MAP & GUIDE – I’m a bookworm and I’ve preferred hard-copy books over digital books. Same goes with a physical map. It’s easier to see the big picture, just need unfolding 😉 Also, just in case your phone loses battery, you’ll have a back-up. A survival phrasebook is useful to have, to familiarize yourself with the country’s culture and learn basic conversation phrases. Lonely Planet Japan Map and Japanese Phrasebook and Dictionary will make you feel like a local when you no one knows how to speak eigo. COIN PURSE – We’ll get to the “cash is king” memo in a bit, but in Japan, you will rack up lots and lots of coins because the most common form of payment is cash. As you use cash, you’ll end up with coins, so having a coin purse will help you organize, locate and separate your crisp bills from your baby yens. Might as well get a cute one, just like this exquisite handmade buckle coin purse from Jan Dee. MONEY – Of course without money, how can you have fun, let alone survive your trip? Save up and cash in the yen. To-date $1 = 112Y. Carry more cash than credit card as we recently learned Japan is predominantly cash-culture. A lot of the places we went accepted cash only. Don’t be afraid to carry a lot of cash as Japan is super safe. As far as utilizing credit cards- VISA or Mastercard are the most common. Make sure to inquire with your bank or credit card company for fees associated with international transactions. Personally, I know that Capital One does not charge foreign transaction fees. If you run out of cash, the best place to get it is at an ATM at your nearest 7-Eleven. With 22,000 locations, they’re conveniently everywhere in Japan and they’re open 24 hours. HAND SANITIZER – Japan’s cleanliness is immaculate. Ironically though, their bathrooms lack soap and even hand towels. Therefore, you must carry with you at all times, hand sanitizer or hand wipes. Most people carry their own handkerchief. Stock up with travel-sized hand sanitizers and single-use wipes from Bath & Body Works or Purell. COMFY SHOES – For a shoeholic like me, I cannot stress it enough that you should not only find fabulous shoes, but also comfy ones. Trust me, you will do miles and miles of walking. And yes, the mythical combination of looks & comfort exist. Last trip, I learned to value my boots and booties as they are fitting for the season. However, I’ve learned to absolutely love my casual white sneakers as they matched with almost any outfit, whether it’s with leggings, skinny jeans, or even a dress! In Japan no matter what type of skirt or dress – flowy, midi, maxi (even mini), a pair of white fashion sneakers will finish the look! ELECTRONICS – Your phone, of course! A digital camera to capture memories, a travel adapter as most of Japan’s electrical outlets are two-pronged “Type A”. Don’t forget to rent a pocket WiFi for Google and Google maps, the internet have all the answers when you’re on an adventure. JR PASS – Hands down, a total money saver. This will save you hundreds of dollars in travel fees especially if you’re going from one major city to another. We used our passes mainly to get from Kyoto to Tokyo and Tokyo to Osaka in the shinkansen (bullet train), and any transportation owned and operated by Japan Railway throughout the rest of our stay. You can buy them in 7-day increments and you have an option to purchase a regular pass or Green (First Class) pass. We opted for the Green pass as it guaranteed seat reservations and more leg room for Brons. Learn more about the JR Pass here. LUGGAGE – Packing a light, small suitcase can help you navigate Japan a bit easier. Crowded stations and trains leave very little room for large luggage. Even the shinkansen allows minimal space for large luggage, with the overhead compartment being able to accommodate carry-on sizes. Opt for a suitcase with spinner wheels, 4-wheeler even an 8-wheeler if you can – so much easier to maneuver! Especially towards the end of your trip in which it will get heavier as you fill it up with omiyage. This innovative carry-on Luggage Crew 11 from Travelpro might just do the trick. It’s expandable and lightweight, and it has an external USB port to charge to gadgets! Super cool. Hope this helps your planning. Would love to hear about your trip! Today, March 11, 2012 marks the first anniversary since the heartbreaking devastation in Japan that struck the world. We saw before our eyes massive destruction caused by an unstoppable earthquake and tsunami. Death toll rose to a little over 19,000. This morning in Japan, people prayed and stood in silence to remember the vast earthquake, paying respects to those who lost their lives. A project that I started with Fashion With A Mission last year after hearing of the tragedy was to fold one thousand paper cranes- one paper crane per dollar raised through FWM’s jewelry sales. For those who are not familiar with the symbolism of one thousand cranes- Japanese legend promises that anyone who folds a thousand origami cranes will be granted a wish by a crane. In Japan, the crane is a mystical creature, believed to live one thousand years. The paper cranes are held together with a string- 25 strings of 40 cranes each. 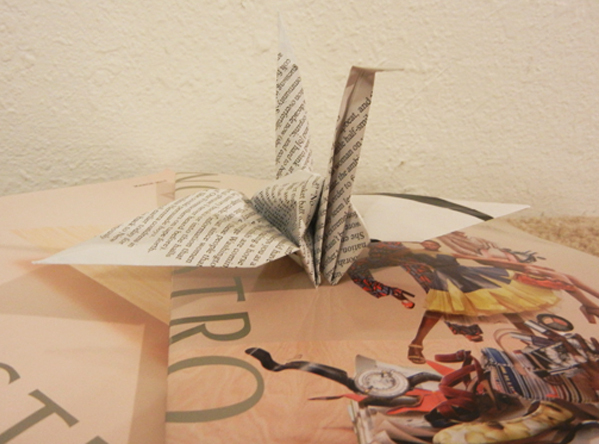 This year continues with increasing FWM’s Japan Relief Fund, as well as folding of cranes. Once the goal is reached, FWM will then send the donation to assist orphans and children impacted by the tsunami. I am hoping to visit Japan next year. Although I am far from reaching the one thousand cranes, hopefully there will be others that will support the relief. 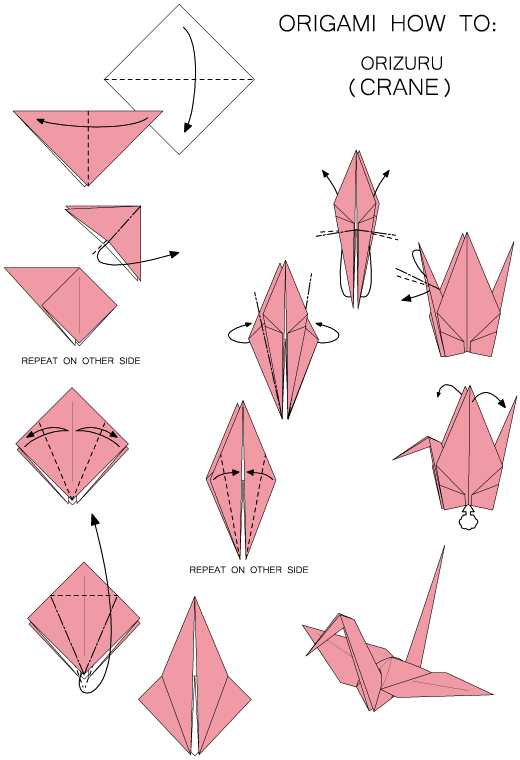 In observance of Japan’s catastrophe, I would like to share instructions on creating paper cranes, raising hope that one day, the shattered shores of Japan will be rebuilt stronger than ever. You can use any paper, as long as it’s a square. 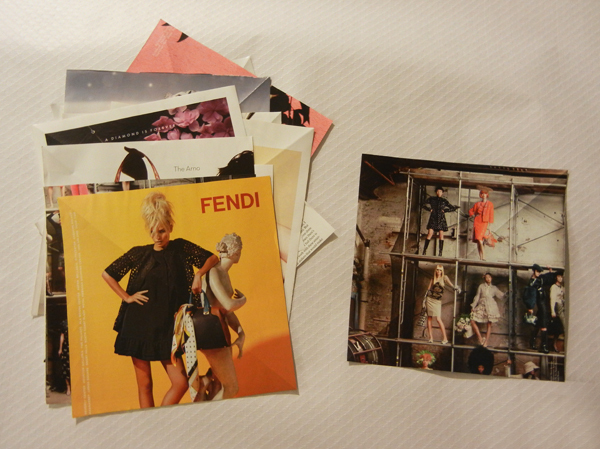 I use old fashion magazines. If you have a few minutes to make a paper crane today, please do so. You are one more person believing in a better tomorrow for Japan. *PS e-mail me a photo. I would love to share it.